McDonald's is pulling back 12 million collectible "Shrek" glasses after toxic cadmium was discovered in designs painted on them. The U.S. Consumer Product Safety Commission announced the voluntary recall early Friday, warning consumers to immediately stop using the glasses; McDonald's said it would post instructions on its website next week regarding refunds. "A very small amount of cadmium can come to the surface of the glass, and in order to be as protective as possible of children, CPSC and McDonald's worked together on this recall," said CPSC spokesman Scott Wolfson. The glasses went on sale May 21, and about 7 million have been sold so far. The rest were awaiting sale. 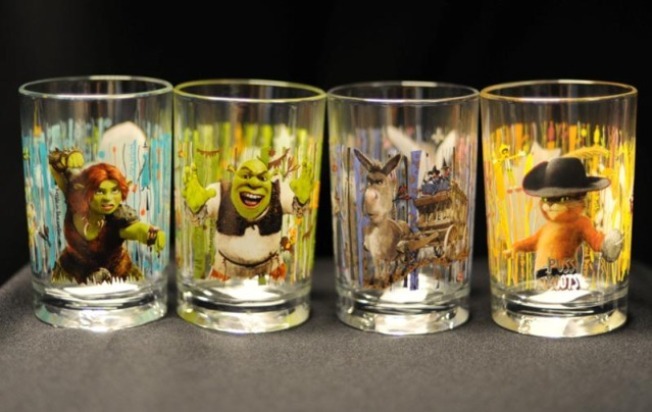 "We believe the Shrek glassware is safe for consumer use," McDonald's spokesman Brad Whitman told The Associated Press. "However, again to ensure that our customers receive safe products from us, we made the decision to stop selling them and voluntarily recall these products effective immediately."